:: steph chows ::: Cookie Round up!!! I just want to say a huge THANK YOU for everyone who participated in this! I had a wonderful time and I hope you all did to! Sorry for the delay in the write up, but here is what I heard back from you all! First off Amanda and Ann! 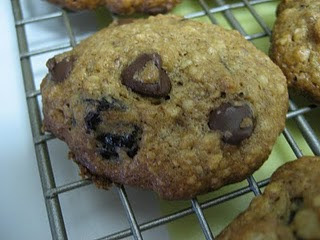 Ann sent oatmeal choc chip and oatmeal raisin cookies. Amanda in her own words sent "steph, here are a few pics of the cookies I sent to ann. 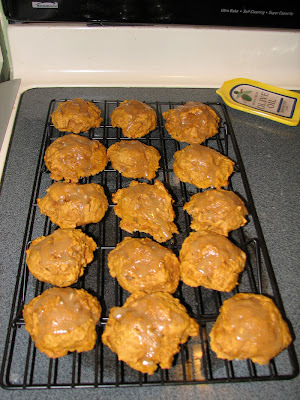 they are called pee wee cookies, and the recipe is from a book my sisters and I read when we were kids. we've been making the cookies ever since! 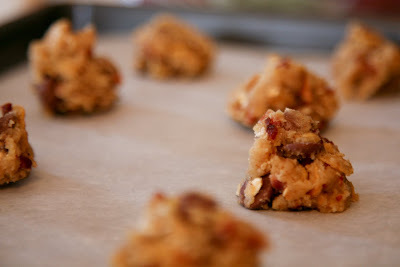 they are basically choc chip with oatmeal, pecans, and corn flakes, though the unbaked ones in the photo have some bacon mixed in as a little experiment I tried this morning... ann, I hope yours arrived safe and sound. thanks again to you both!" How amazing do they sound... and the pictures... beautiful! Next we have CaSaundra and Valerie. 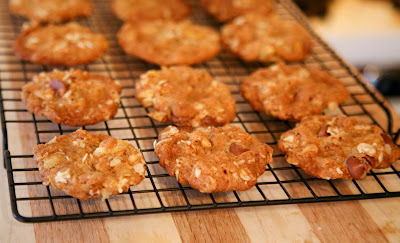 Cassie sent over some oatmeal scotchies (delicious, chewy oatmeal butterscotch cookies). Val "sent her coconut almond bars and some cherry winks (essentially a sugar cookie base with dates, pecans and cherries, rolled in corn flakes before baking. She emailed and said they were tasty." Next we have Wendy and Sarah, both with little girls who helped bake up a storm!! Wendy sent chocolate chip espresso cookies, and some canadian momentos. Wendy's daught Carly is the chef here, too cute. 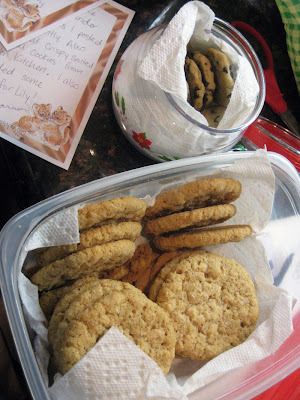 Sarah and her daughter Kaileigh sent Oatmeal Cherry White Chocolate Cookies and Easy Lemon Cookies! Next are the Lisa's (I had to pair them up). 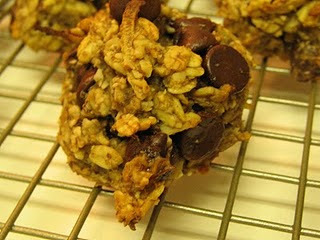 Lisa A sent Tasty Trail-Mix Cookie and Nikki's Healthy Cookie. Then we had the Natalie's that I also had to pair up! 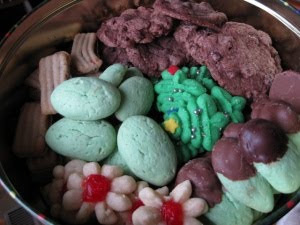 Natalie H sent Andes mint cookies! Natalie M sent Grammy's chocolate cookies!!! I paired Jeanne and Ashlie together. Jeanne sent some gingerbread, date squares, and sugar cookies. Ashlie sent this amazing variety! I never heard back from Tanya or Katie so hopefully their cookies made it safely to each other! Next is Nicole and Shannon. 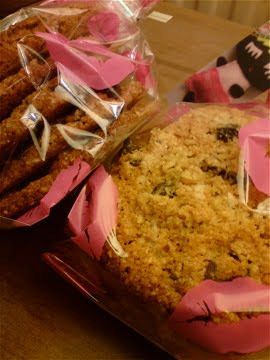 Shannon "sent Nicole some Blueberry Lavender Butter Cookies and Crisp Salted Oatmeal White Chocolate Cookies. Nicole sent some amazing Chocolate Peppermint Cookies and Oatmeal Cran White Choc Cookies. Stef and Kendra are up next. Stef sent Mexican Mocha cookies and Gingersnap cookies! 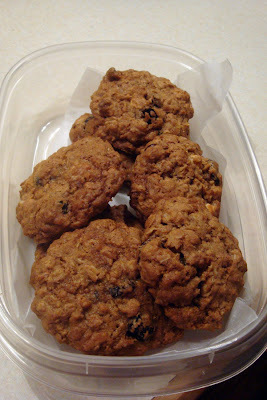 Kendra sent Loaded Oatmeal Raisin Cookies- oatmeal, raisins, butterscotch chips, and a bunch of yummy spices. Here are some pics of Kendra sharing said cookies with her coworkers lol. I was matched up with Out of the Rabbit hole. I sent her poose cookies! She sent me two types of toffee cookies! For some reason the image on her site isn't working and I didn't grab it before! 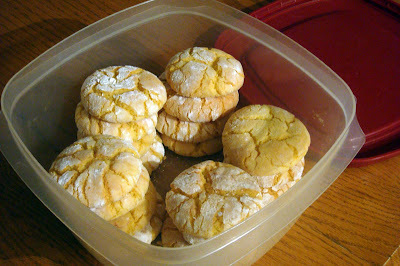 Leslie sent soft sugar crusted ginger cookies, and glazed pumpkin cookies. 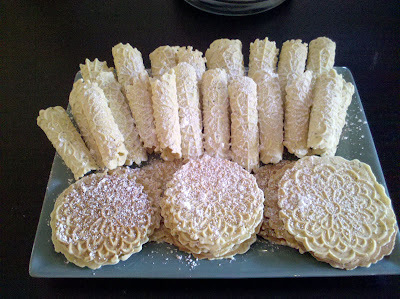 Maria sent two types of her famous family pizzelles (traditional and chocolate orange)! Suhagi sent her some chocolate rum balls. And the final two! Linds and Tam participated with us over in the UK! 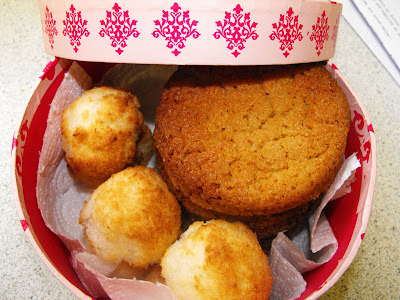 Linds sent some flourless peanut butter cookies and some coconut macaroons. 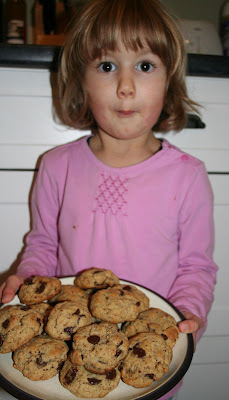 Tam sent chocolate/raisin and coconut golden syrup cookies that were gluten and dairy free! Phew that was a long post! Hope you enjoyed all of the cookies and make some for yourselves :) Thanks again everyone!!! Not a problem, Sarah sent me the recipe so here you go! Pour cake into a large bowl. Stir in eggs, oil, and lemon extract until well blended. Drop teaspoonfuls of dough into a bowl of confectioner's sugar. Roll them around until they're lightly covered. Once covered, put them on an ungreased cookie sheet. Bake for 6 to 9 minutes in the preheated oven. The bottoms will be light brown, and the insides will be chewy. Thanks again for putting this together! I had a ton of fun! All these cookies look amazing! There are some good lookin cookies going on here. Great round up, I'll go check out a few of your links! Hope your having a great week! wow, all of it looks so scrumptious! i need to learn to bake, big time. 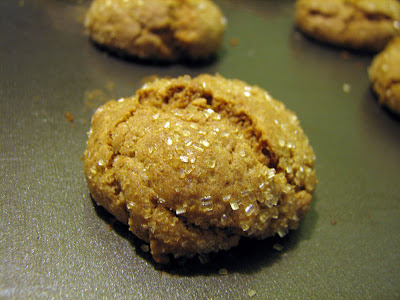 Oh, yay, you've posted the lemon cookie recipe. They're such a pretty color, they caught my attention right away. It was so fun! I can't wait to do it again! Wow! 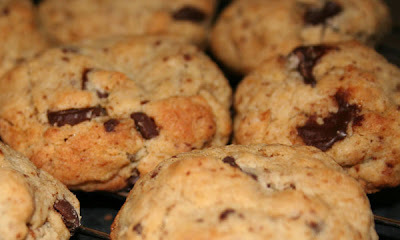 A wonderful round up of great cookies indeed! Oh, all that cookie love going around! It's like a mini cookie soiree! What an awesome cookie exchange! I'll be waiting for my box with one of each kind to sample! (Insert happy face). Hey everyone, I'm Lisa K. and my cookies weren't described at all... so here you go! The ones on the left in the mini baking wrappers are French Christmas Cookies (http://www.tasteofhome.com/Recipes/French-Christmas-Cookies) made with chocolate covered sunflower seeds instead of plain-'ol choco chips. The ones on the right are freakin' delicious Chewy Chocolate Gingerbread Cookies(http://www.recipegirl.com/2008/07/31/chewy-chocolate-gingerbread-cookies/). Lisa I added the description in! All I had was the picture Lisa posted but there wasn't a description! Thanks! This was great fun and I made new friends in the process! :) Thanks for organising this Steph, look forward tot he next one! OH, that was fun to see what everyone did. Next time, I'll be more adventurous. I was thankful the cookies arrived in good standing over the border. I think Sarah and I will do a cookie exchange every year and our girls can be baking pals. Thanks Steph for organizing all this! wendy that is so exciting to hear you've made cookie pals out of each other! I love it! Want more chow like what you just read? 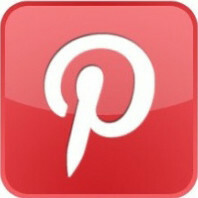 You can click to subscribe to the feed, follow me on twitter, or become a fan on facebook! Can't wait to see you there! Want to be my friend? come on over! Subscribe to RSS Feed don't miss a post! 2013 ::steph chows::. Powered by Blogger. So this is the spot where I tell you that you are a big boy or girl and make food choices for yourself. I'm not a dietitian... nor do I play one on TV! I do this for fun and for the sake of sharing and meeting new people. If you don't agree with what I cook or the ingredients I use that is 100% ok, please just don't harass me with insults about why I choose to eat the way I do :) thank you! Copyright © 2012 :: steph chows ::.